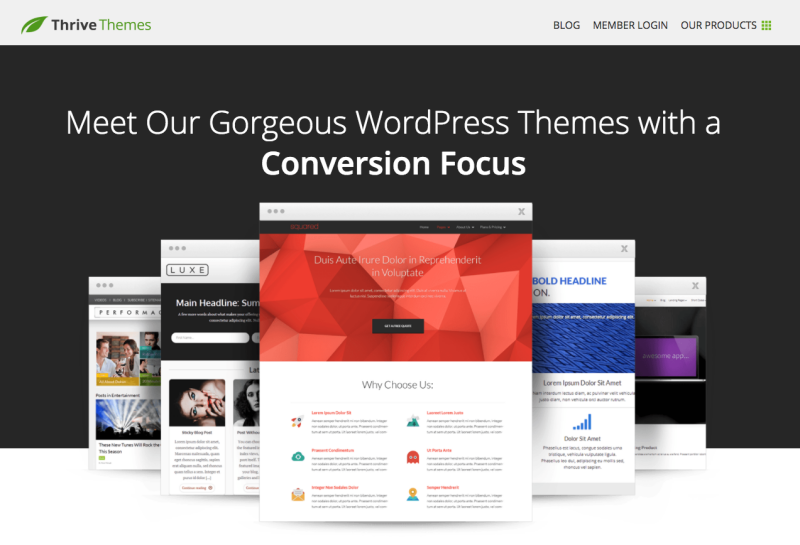 Thrive Themes VS Genesis Theme Framework: Which Should You Use? If you’re having trouble deciding between Thrive Themes and Genesis Theme Framework, in this post, we’ll compare the two themes so that you can make a decision on which one will be best for your needs. If you’re a frequent reader of Magnet4Blogging Media, then you’re probably aware that over the years, I’ve made quite a few changes to this site. In the very beginning, I was drifting between using the Genesis theme framework and Thrive themes. I decided to make a permanent switch back to Genesis a few years ago now, and I’ve not looked back since. So, what does this have to do with anything? You might be wondering. Well, I’ve had ample of hands-on experience while using both of these great themes, which is why I decided to write this comparison post of Genesis theme framework and Thrive themes. I’ve written in-depth reviews of both of these themes in the past too. You can read my detailed Genesis theme framework review here. You can read my detailed Thrive Themes Membership review here. In this comparison review, we’ll dive into each of the areas listed below for both Thrive and Genesis. OK, so let’s dive straight into it. I won’t go overboard here, as I said, I have already reviewed Genesis in the past. StudioPress is, in my opinion, an industry leader when it comes to creating premium quality themes for WordPress. They are the undisputed kings. StudioPress’s core product is the Genesis Theme Framework software. The StudioPress marketplace also boasts a library of high-quality child themes that work with Genesis, both from StudioPress and third-party child theme developers. Whether you’re a developer or not, I’m sure you’d agree that Genesis is a powerhouse framework to work with. For me personally, it makes building websites with WordPress an absolute joy. Genesis has been on the market for quite some time now, so they’ve circulated well. In fact, half a million WordPress websites today is powered by Genesis. I started using Genesis way back in 2010 at the start of my blogging/entrepreneurial journey. 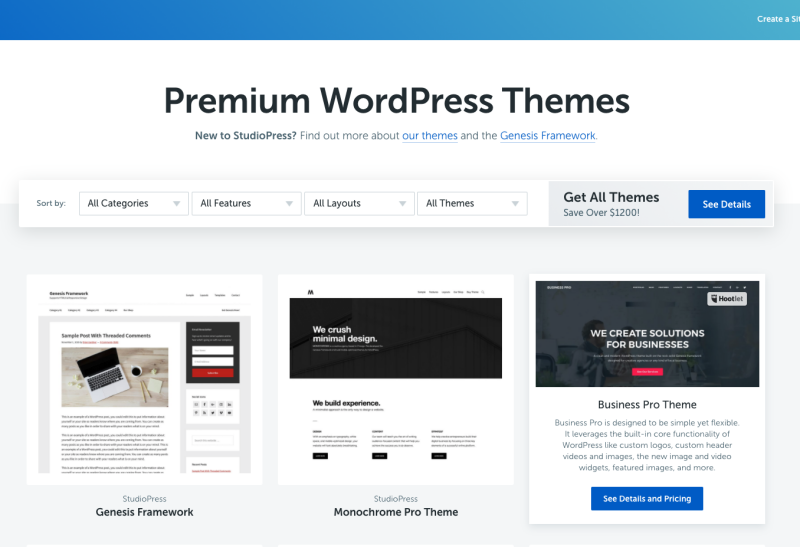 So, it’s clear to see that StudioPress, have put in a lot of time, money, and research into developing what is considered today as ‘the industry standard’ in premium WordPress themes. Out-of-the-box SEO tools and options. Ready for advertising and monetizing your blog. As I mentioned earlier, when it comes to ‘child themes’, the StudioPress marketplace has a wide range to choose from. Each child theme is designed to make your website ultimately look sleek and professional, regardless of the type of business you have. Customizing a Genesis child theme is probably one area that I think could be improved in a way that makes it easier for non-tech-savvy users. Using Genesis doesn’t require you to have complex knowledge or experience with coding, however, there is that small obstacle to consider when it comes to simple modifications. Yes, knowledge of some basic HTML and CSS will help you make the most of your Genesis child theme, but if you’re just starting out with Genesis, you may find it a little bit challenging to start. For non-tech-savvy users, however, there is another solution to make customizing a Genesis child theme easier. That solution comes in the form of a plugin called Genesis Design Palette Pro, and you can learn all about it here. With a Genesis child theme, you can apply simple customizations like upload a custom logo and change the theme color, change favicon icons, etc. If you wanted to take your customization a step further, however, such as making changes to the typography, background colors, hypertext link colors, navigation, adjust paddings and margins, borders, etc. you’d have to either start hacking into the style.css file for the child theme or, install more third-party plugins. Now, sometimes installing more plugins is not a great solution as this can affect the performance of your website’s loading times. Which is why the Genesis Design Palette Pro plugin exists. So, overall, customization can throw up some challenges, especially for new users, but once you get past that obstacle, customizing a Genesis theme becomes easier. 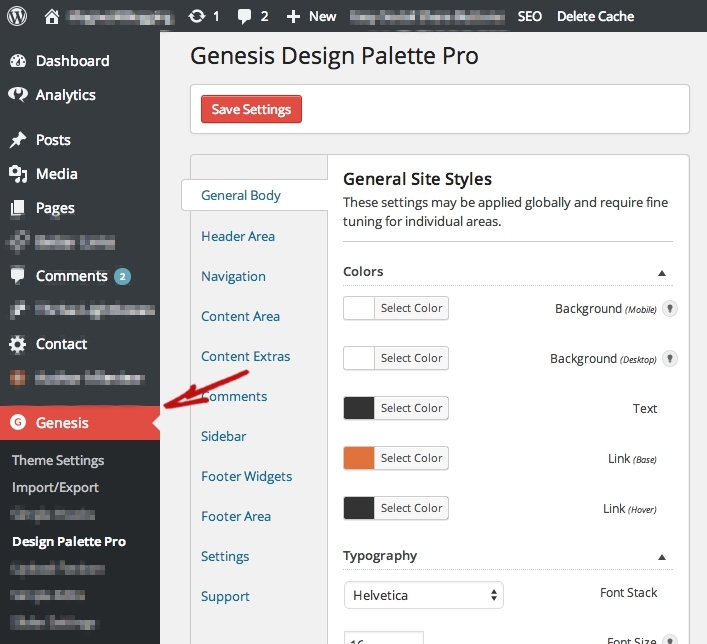 Click here to see how I can help with your Genesis Child Theme customizations. Genesis theme framework is built on lightweight coding, and you immediately notice this when you download the software after you purchase it. The Genesis parent theme file is relatively a small (Especially when compared to a Thrive Theme file). Ultimately, that should help improve page loading times, right? Installing ‘Genesis’ the parent and a child theme for the first time is easy to do. If you do happen to take the Genesis route, I created a useful little installation video you can check out here over on my YouTube Channel. The video is a good few years old now, however, the installation process has not changed a single bit. 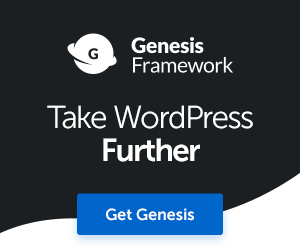 Now we get down to the cost of using Genesis theme framework on your WP website. Genesis theme framework alone, (the parent theme), will set you back a cool $59.95. Its been that price for as long as I can remember. You also have the option to purchase a theme package, (Genesis parent + 1 Child theme of your choice), which varies in price from $99.95 and upwards. Or, you can purchase the Pro-Plus theme package (Genesis and all available child themes and future child themes) for $499.95. The one thing I love the most about using Genesis is that you literally get unlimited everything for what you pay, including updates and support. There are no options to purchase a developer license, or no annual membership fee even. You can simply use your single purchased Genesis theme package on unlimited websites, your own or your clients. Many other theme builder companies will have you pay for a separate developer license, so keep that in mind. For me, this is a huge selling point. I purchased Genesis way back in 2011, and here we are in 2018 and it’s still proving to be a rock-solid investment for my online business. If you’re looking for an extremely robust, lightweight, flexible, and affordable theme framework to work with, then Genesis is definitely one option to take. StudioPress currently has over 50+ child themes available to choose from, that’s not including all the third party child themes available from independent developers around the web, so you’re bound to find the perfect one for your business. Recommended reading: Check out my detailed review of Genesis here. OK, so it’s time to get excited about Thrive Themes, but not too excited and I’ll explain why. 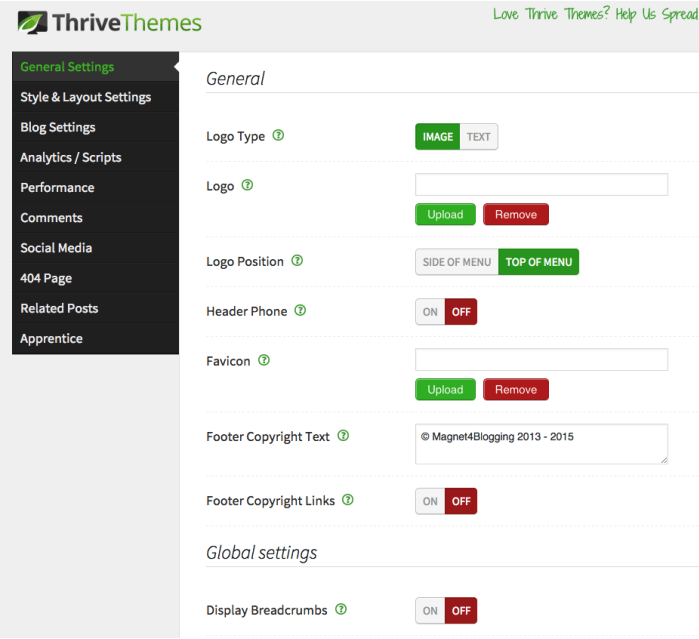 Thrive Themes are currently in the process of building a new complete, drag-and-drop, Theme Builder tool. That’s the exciting bit. The not so exciting bit is that you cannot purchase any themes individually from Thrive Themes any more. If you’re already a member of Thrive Themes, you can still access the themes in your account, but as for new customers, they’re no longer available. So this means, for the time being, we can’t provide you with an accurate comparison of Thrive themes with Genesis. In time, when Thrive decides to launch its new Theme Builder tool, we’ll be sure to update this comparison post. I used a Thrive theme (Rise theme) for about a year before deciding to switch back to Genesis. I wanted to really give them a good try before deciding to give my honest opinion about them. 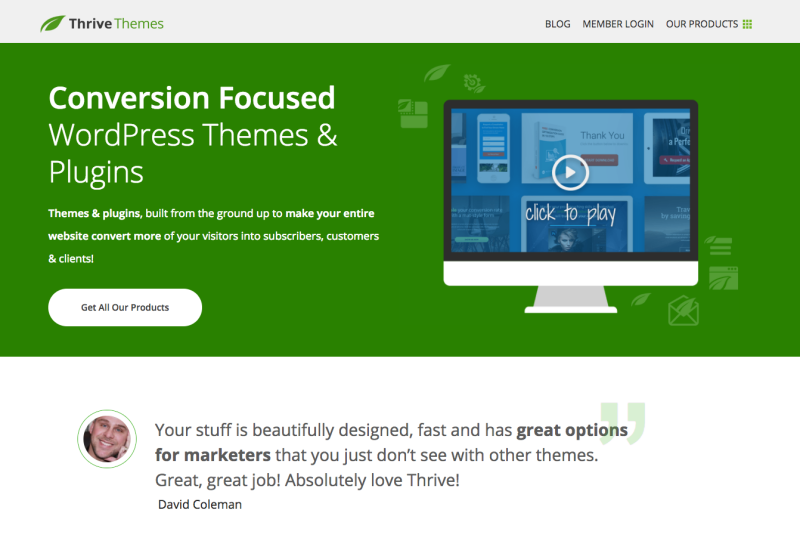 Thrive Themes make more than just premium themes. 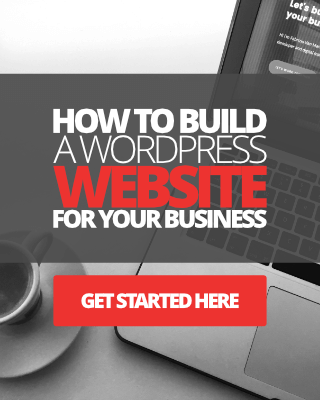 The company is well known for its wonderful suite of conversion marketing tools and plugins for WordPress, such as Thrive Leads, Thrive Architect, Thrive Optimize, and Thrive Headline Optimizer, to name a few. When it comes to actual WordPress Themes, however, Thrive doesn’t really have a great deal on offer. In fact, to date, they still only have 10 themes to pick from. Themes are built for speed, though, the theme files are quite large. Designed for user engagement and improved readability. Customizable elements, fonts, and layout. Rock-solid support, training, and tutorials. Despite the limited choice of themes, customizing a Thrive theme is a lot less challenging than customizing a Genesis child theme due to the available customizing options. However, to make the most of customizing a Thrive theme, you still need to have some basic knowledge of CSS. With each theme, you get lots of options to able and disable elements and features, as well as a Custom CSS box where you can add your own CSS rules to override the theme’s default CSS. Things like, adding a custom logo, uploading a custom Favicon, changing footer credits, adding custom menus, changing typography styles, changing font sizes and color, background colors can all be done easily using the built-in style and layout settings, and without the need for installing additional plugins or writing new code either. Sounds like less work for you to do, right? From a development standpoint, if you plan to develop the theme further it could prove to be quite challenging. Thrive Themes CSS appear to be a completely different language than what you’d expect to find in a Genesis child theme Style.css file. Meaning it will take some time to get used to. Installing a Thrive theme is very easy to do, just like you would install any other bulk-standard WordPress theme. Once activated, you simply add your license key and you’re set to roll. Unlike Genesis, where you have to pay for the parent theme and then the child theme separately, with Thrive Themes you can either purchase a single site license at $49 per theme, or an unlimited personal site license at $67 per theme. Or, you can signup for the Thrive Themes annual membership at $228 per year for a Personal license, or $588 per year for an Agency license (Paid annually). As a Thrive Themes Member, you get access to all of the current themes, all future themes, plus all of the Thrive conversion focused plugins and marketing tools. Thrive Themes are still fairly new when compared to Genesis, however, even though you have a small choice of themes, you can’t really go wrong with a premium theme that has so many built-in options and features that eliminates the need to install additional plugins. That’s the Thrive theme. If you’re looking for a very clean and professional looking, fast loading, easily customizable theme for your website, choose a Thrive theme. 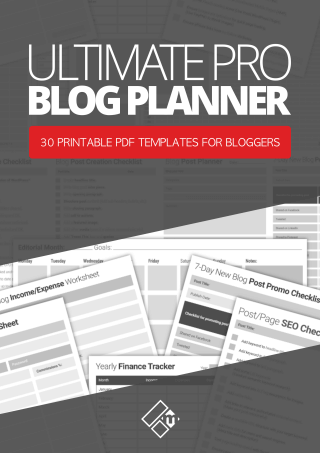 Which theme will you choose for your blog or website? Before you make a decision on which theme is best for your needs, here are some comparison information for you to glance over. In the page speed test, the Thrive theme loaded much faster than the Genesis theme, however, there are a lot of other factors that determine page loading speed, not just the size of the theme files. Genesis Theme Framework: $59.95 on its own. $79.95 to $99.95 per theme package (Unlimited sites, updates, and support) – $499.95 for the Pro Plus All-Themes Package, no annual membership or developer license required. Thrive Themes: $49 per theme (Single site license) $67 per theme (Unlimited personal license) – Or $228.00 Thrive Personal Annual Membership ($19 per month). $588.00 Thrive Agency Annual Membership ($49 per month). Genesis might seem like the slightly better value to go for as there is NO annual membership fee to burden you. You pay a one-time fee and you get unlimited everything forever. Plus, you get access to all future theme releases. In addition, you can use the themes you purchase not just on your own websites, but also your client’s sites. For all you web designers and developers out there, this is a great deal, right? With Thrive Themes, on the other hand, although you pay a $228.00 or a hefty $588.00 annual membership (even more if you decide to go for pay quarterly option, $360 per year and $828 per year), you do get a lot of bang for your buck. All the themes plus award-winning conversion marketing plugins. Genesis Theme Framework: 50+ current available themes and growing. Thrive Themes: 10 current available themes and growing, maybe? Genesis Theme Framework: Custom widget areas, theme layout options, comment functionality, built-in on-page SEO options, ready for ads, auto-sized images. Thrive Themes: Custom widgets, theme layout options, landing page templates, fonts manager, built-in social sharing tools, related posts feature, Favicon uploader, custom footer/credits, lazy loading comments functionality, image resize and optimization, custom 404-page text editor. Genesis Theme Framework: Simple to install and manage. In-depth customization can be a little challenging even though Genesis comes with a lot of widget options and theme layout options. Also, a little knowledge of HTML and CSS will help you get the most from your Genesis theme, but absolutely not essential. The StudioPress website has a host of resources, code snippets, and documentation to help you with the further development of your child theme. Thrive Themes: Very simple to install and manage. Simple layout options and custom CSS box provided for site customization, many built-in features removing the need to install additional plugins. Taking customization to the next level with the further development of your theme can prove to be challenging. To be very fair, both Thrive Themes and StudioPress’s Genesis have a variety of ‘unique’ things on offer when it comes to their premium themes. StudioPress has been on the market for much longer than Thrive, where over 500,000+ website and small business owners trust and run on Genesis. Thrive Themes are still relatively young with around 14,000+ members, but they’re growing very fast. I’m sorry if this review is too “in the middle of the road” for you, but it really comes down to your preference and what you really want to achieve with your blog, website, or online business. If its conversions you’re after then go for Thrive, you get a lot more than just themes by the way. If you’re looking for a more minimal and professional look and feel of your website or business, then go with Genesis and a child theme of your choice. I hope this comparison review has been helpful to you, I’ll leave you to decide which is best for you. Fabrizio, Great post you did but i would like to know. Is it one time cost or every year they charge to ” Purchase a single site licence at $49 per theme”? Actually I wanted to buy. Ohh thanks @Fabrizio to letting me know. My son looks after my sites and he installed Thrive with the Content Builder. It’s easy to use, even for a tech-phobe like me. @fvmart:disqus Great to see your article, I’ve switched to genesis and it’s really cool! My experience with Thrive Themes is that they are not ethical businesspeople, I will never do business with them again unfortunately. Marketers Delight is better than both of them. Thrive’s code is super hacky in just about every product. Not WordPress standards. 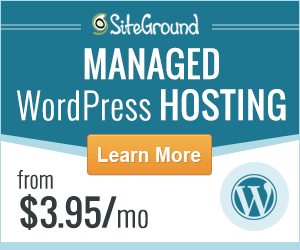 It should be a stand-alone software, not on WordPress. They violate all kinds of coding standards. The styling of the elements in the builder looks like 1992. Genesis is a way better option than Thrive, however, you need a developer to modify anything in it. Just my two cents. Take a look at Marketers Delight. It’s built on solid code and just enough built-in features to where it’s not bloated. Great for non-tech people. No, I’m not an affiliate for them. But I am a code snob though. Thanks for visiting. Your comment is very useful and it’s great to get different perspectives on either Genesis or Thrive, or indeed as you’ve shared something else entirely. I’ve not heard of Marketers Delight before so will be sure to check it out. When I started using Thrive Themes some years back I loved them, and I still do for the most part. But I switched back to a Genesis theme (Digital Pro) with some of my own modification mainly because of what you said above. Some elements inside of the Thrive custom builder looks a little bit dated. Some of Thrive ready-made theme’s looks a little dated too I might add. I’m not a code snob, but I do like to have more control over the development of my website and my clients websites too, and Genesis fits the bill for this well. Thrive themes on the other hand is simple to hack into as far as styling goes, but I feel there’s some limitations there. Im using thrive content builder as landingpage & genesis as primary theme. Interesting post but you gave us no conclusion of which was better, completely middle of the road on the review so whatever link we click you grab your aff commission, right? You didn’t even test the SPEED performance of each head-to-head which is one of the main selling points of each. Thanks for your feedback, Mike. I will make a note to test the performance of each theme when I update the review in the coming weeks.